Completely remodeled condominium with spectacular ocean views and will accommodate up to six guests. Centrally located, Kona Luana is within a ten minute walk of Kailua-Kona Village. There are many attractions some of which include Kailua-Kona pier, variety of dinning options, waterfront shopping, Farmers Market, coffee shops and friendly locals. Kona Luana is about 10 miles south of Kona Airport and about a 1 hour drive to volcano park. A forty-five minute drive to Manua Kea and about a two hour drive to Hilo. There's plenty to do if you have the time, anything from scuba diving, snorkeling, sport fishing, biking, hiking, horse back riding and whole bunch more. Major stores are minutes away, Costco, Walmart, Safeway, Macy's, Home Depot, Cinemas and much more. Kona Luana is a unique 3 story condominium. Unit 1 is on the first floor and is not a rental. Unit 2 and Unit 3 are on the 2nd and 3rd floors. both opposite each other, both of which have the identical floor plan. Living room: Includes High Speed WiFi Internet, Direct TV, Premium Channels. A large 42' High Definition flat screen * DVD player * CD Player. A office desk, Couch sofa that pulls out into a queen size bed. A gorgeous, recently added bamboo flooring, both upstairs as well as down stairs. A breath taking 180 degree view of Kahului Bay that is only feet away. The living room has a new Air Conditioner and ceiling fans, just in case you need them. Kitchen: The kitchen has been completely remodeled. Wood cabinets, corian counter-tops, dish washer, refrigerator, micro wave and range, completely equipped with every kitchen cooking and eating utensil you can think of. The kitchen also has a private lanai overlooking Alii Drive. Master Bedroom: Newly remodeled, bamboo wood flooring throughout the home, King size tempurpedic bed, two large closets, ceiling fan, air conditioning, large 42" flat screen TV with DirecTV and premium channels, ie. HBO, Showtime and cinemax. This bedroom has an Incredible ocean view with private lanai. and lanai furniture and table. Relax and watch all the water activities during the day, or in the evening gaze at the stars or beautiful Hawaiian sunsets. Master Bathroom: Newly remodeled from head to toe. Custom travertine tiling, tub and shower, dark wood cabinets, low profile toilet and new fixtures. 2nd. Bedroom: Second bedroom has two twin beds, no air conditioning, a ceiling fan and large closet, also has ocean view. Kona Vacations Rental provides the optimal way to enjoy your Hawaiian vacation with all the luxuries and comforts of home, shopping, dining and entertainment are well within walking distance. Our goal is to provide you with first class customer service, clean and well maintained accommodations making your stay with us an unforgettable, Kona dream vacation. We take pride in both our vacation rentals. Our main goal is that you are totally, 100% satisfied with your stay and you keep coming back. If you take a look at our calendar, you'll see some dates are booked up to a year in advance. These are generally guests that have stayed with us before. Please take time and read the reviews left by previous guest and decide if this place is for you. If you have questions about our Kona Vacations rental, please give us a call and we will be happy to assist you. Married 35 years, two children, two grandchildren, 5 dogs. 2 goats, 3 Macaws, and a few other critters. Throughout the years and having visited the Islands of Hawaii, we fell in love with the Big Island. 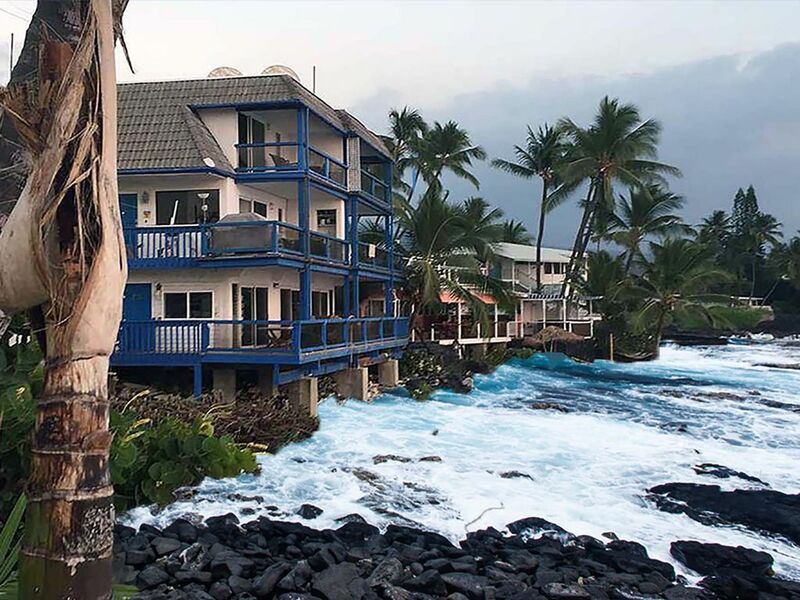 In 2008 we purchased Kona Luana, units 2 and three, a unique oceanfront, 3 unit condominium. The Hawaiian beaches, beautiful scenery, Polynesian culture and slower pace is what we fell in love with. Imagine driving without traffic, where people are very friendly, the beaches are breathtaking and not over crowded, the sunsets are spectacular, weather is always outstanding. The Hawaiian Islands claim 8 - 11 of the worlds 14 climate zones. Living on the Big Island is about as close as it gets to being in heaven. A place we hope to visit often and retire too soon. Situated right on the ocean, this unit has 3 private lanais. Two overlooking the pacific ocean and the other that overlooks Alii Drive. Each lanai includes an outdoor barbecue grill, lounge chairs and tables. Centrally located, Kona Luana is within a ten minute walk of Kailua-Kona Village. There are many attractions some of which include Kailua-Kona pier, variety of dinning options, waterfront shopping, Farmers Market, coffee shops and friendly locals. Kona Luana is about 10 miles south of Kona Airport and about a 1 hour drive to volcano park. This is a very exclusive Condo that has been completely remodeled from top to bottom. All the amenities you'll possibly need. Watch the Spinner Dolphins and Humpback Whales up close and person from your private lanai. Watch the beautiful Hawaiian sunsets or gaze at the stars, either way their breathtaking sights to see.. This unit is supplied with beach chairs, beach towels, Boogie Board and ice chest. This unit has on-site parking for one small to medium sized vehicle. There is also additional free parking directly in front of the condo on the street. The Pacific Ocean is directly in front of you. There is a 180 degree view with no obstructions. During curtain periods, Whales can be seen throughout the day breaching along with hundreds of dolphins. Kona Luana is on Alii Drive and 1/2 mile from downtown. This condo is only feet from the water. Kona Luana has a 180 degree Spectacular Ocean View, with no obstructions. Newly Remodeled. / Fully Equipped. We will be coming back again! Great experience, great location, great condo. Ideally located within walking distance to downtown Kona and 15 min drive to the best snorkeling beach park (kahalu'u). The appartment is furnished with all desirable amenities, with a complete kitchen, several bathrooms, a very large bedroom with a complete view of the ocean and great balconies to sit ,have coffee, read and watch for boats and whales ( occasional sightings in the distance). This was for us a good base to visit the whole island with a rental car and walk to the restaurants. We like our own diet and cooking and we were happy with the setup. There is air conditioning on both levels, but we hardly used it as the large screened sliding doors and ceiling fans were more than sufficient, also providing the sound of crashing waves to put you to sleep. In addition, any problems we had were taken care of seriously by Mark. Perfect house with a perfect view! Amazing house that is fully equipped. The view is the best! Don’ Stay here if you don’t want to see Dolphins and Whales everyday. The view was spectacular. The waves crashing on the rocks never stop, making it impossible to sleep, (just kidding). The owner Mark responded promptly to every email or question. He was generous and let us check out late. We would love to tell you not to stay here so we could have it all to ourselves whenever we wanted. Walking distance to just about everything. Will be staying here again! As advertised. Good location and nice deck right over water. There is quirt a bit of street noise as right on the main road - but the main bedroom and the living room are away from that and that helps. Air conditioning works in main BD and the living room, but are window units that blow hot air onto the deck area - so that is an issue. Not sure the air works at all in the second bedroom - but there was just 2 of us, so we kept luggage there. Not sure why they didn't replace the old split units- those work so great as we see them everywhere we rent internationally - and the hot air exchange can be placed out of the way. We saw spinner dolphins right off the deck area, and great sunsets when the weather permitted. Volcano Village - 96 miles, Captain Cook Monument - 10.8 miles, Hilo - 77.5 miles, Mauna Kea - 64.8 miles, Waimea - 40.9 miles, Panalu'u Beach - 65.8 miles, Green Sands Beach - 57.7 miles, House of Refuge - 12.7 miles. Hapuna State Beach - 33.7 miles, Hawi - 62.3 miles.